chris collins (fletcher north carolina) on 2017-11-08 22:58:40. Nikhil Murthy (Washington) on 2015-12-15 18:40:16. Canadian Pacific 2816 is covered in 2 months of 2002. In the first month, the train travels from Vancouver, BC to Calgary, AB. The train is chased from the Fraser River Canyon to as far east as Banff, AB. In the 2nd month, the 2816 heads from Lethbridge, AB west to Ft. Steele, BC. Then the train heads north to Golden, BC to join the Canadian Pacific mainline. Finally, the train heads east to Calgary. The train is chased from Lethbridge as far as Canmore for that trip. Milwaukee Road 261 is covered on a 2-day excursion from Minneapolis to Duluth, MN and back. The Mt. Rainer Scenic Railroad is featured in a photo spectacular. The Ohio Central railroad is seen on several days. On June 8, 2002, Grand Trunk Western 6325 heads from Dennison, OH to Morgan Run. There, red F-Unit diesels power the train to Sugar Creek. Canadian Pacific 1293 and 6325 then doublehead the train back to Morgan Run. Finally, the same diesels take the train back to Dennison. On June 9, the 6325 (in GTW livery) leads a photo train from the eastern end of the Ohio Central (presumably at Cadiz Jct.) to Dennison. One of the highlights in this segment that is not seen in the program description is that there is a cab ride on the 6325 since the photographer won that as a raffle prize. On October 5, F-Units painted in the Pennsylvania Railroad colors with OC lettering take a photo train from Morgan Run to Dennison. 6325 (again in GTW livery) then takes the train from Dennison to Morgan Run with many dual photo runbys along the way. October 6 is the highlight on the Ohio Central since Canadian Pacific 1293 and 6325 make several side-by-side runbys on a doubletrack section west of Coshocton. Then there are several solo runbys before the final shot showing 6325 on a coal train. Southern Pacific 4449 is seen in May 2001, still in black paint because of the previous year's Employee Appreciation Special, on an excursion over Stampede Pass from Portland to Yakima on Day 1 and Yakima to Portland via Auburn, WA on Day 2. Spokane, Portland, & Seattle 700 is seen on the Montana Rail Link in October 2002 on a 3-day trip from Sandpoint, ID to Billings, MT. After a 3-day layover in Billings, the train makes its 3-day trip back to Sandpoint. The train is chased from the Pend Oreille Bridge in Idaho to Bozeman Pass on the eastbound trip. On the westbound trip, the train is chased from Billings to the Jocko River Bridge shortly after going through Evaro Hill. Frisco 1522 is seen on the Employee Appreciation Special on several days in May and June of 2001. On Day 1, the train heads from Springfield, MO to Tulsa, OK. On Day 2, the train pulls roundtrips from Tulsa to Sapulpa. On Day 3, the train heads from Tulsa to Oklahoma City. The next day, the train goes to Ft. Worth, TX from Tulsa. There is also footage on June 2 where the 1522 is seen in Texas. 1522 is then seen on her final runs in September of 2002. They comprise 2 weekend roundtrips with 2 different consists from St. Louis to Newburg, MO on Frisco home rails. The Saturday consist had 17 cars and had no dome cars while the Sunday consist had 22 cars and had dome cars. Sam Arendt (Perth ON Canada) on 2011-12-03 14:17:21. Good sound effects. I specially liked the CP 2816. Again another interesting high quality railway video , well done ! Now this is steamer's paradise! [No pun intended!] 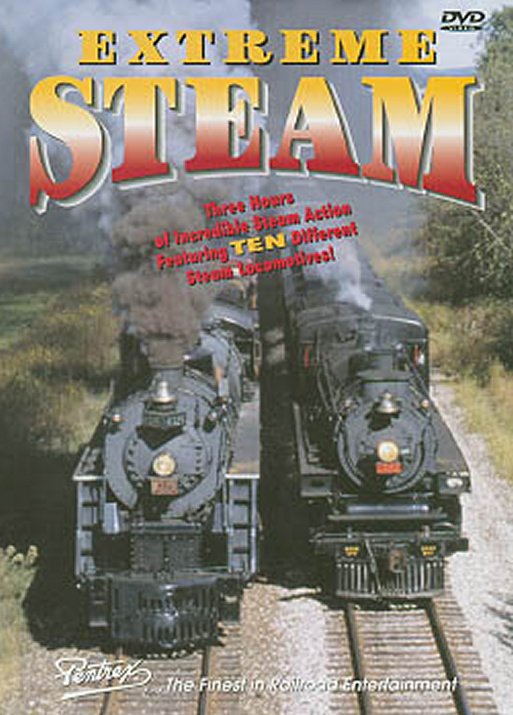 10 steam locomotives in one DVD - what more can you ask for? The production introduces me to some steamers I haven't seen in action before, mainly CPR 2816, the Mt. Rainier's steam fleet, and OC's steam locos. They all were brilliantly shot, looking great in the territory's they were made to work in. And then there's MILW 261, SP 4449 & SP&S 700 and Frisco 1522. These 4 mainline steamers always put on a show, and here, they were no exception. Plenty of whistle-blowing, steam, smoke, wonderful start-ups, dramatic scenery; Pentrex should turn to non-railfan video producers more often for this kind of action. My only qualm with this production however lies within the sound. They repeated some of the same SFX used in earlier scenes which doesn't match up with the later scenes used, not to mention in a couple segments they also used the same footage again, much like in their earlier tapes. wayne olson on 2007-11-02 07:19:57.
i recieved this video for my birthday from my son and enjoyed every minute of it. the ohio central footage is beautiful and makes you want to take a raod trip. but best yet my son gained interest in steam like he didn't have before. great video. If you like Steam, modern day, you will enjoy this movie. It's a movie for the Tourists, the excursion lovers. There is plenty of action with lots of various power from different regions of the USA and Canada. Few of the engines shown are really running with their power at their best, unlike the days in mainline service. From a historical preservation point of view, the movie is good. For railfans who love mainline action with engines showing their full power, not my 'cup of tea'. I'm not disappointed that I purchased the movie, but am not in a rush to purchase Extreme Steam # 2. Steamboy (Revere MA US) on 2018-01-05 09:09:09. I love this video more often. Most steam locomotives today no longer operate (6325, 1293, 2816, Mt Rainier Scenic 5, and Frisco 1522), but I really wish that like this one as well as their 2006 sequel, would make more series of these types �cause every railfan really loves to see a smoking giant or more with a mixed variety in America.